100 Black Cadbury Milk Chocolate Hearts. Use these yummy cadbury chocolate hearts as fillers for your favour and bomboniere boxes or simply give them to your guests singly as a thank you for sharing in your special day with you. Each order is freshly made and the use by date is one year from purchase. 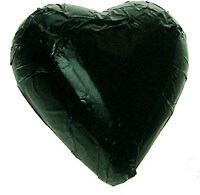 3.5cm x 3.5cm x 1cm, THE LARGEST, THICKEST & CREAMIEST chocolate hearts around!